Unfortunately, for much of this subject, there is no substitute for brute memorization. This course is often used as pre-calculus. "Algebra masters" will have a much smaller memorization load than other students. [I mean College Algebra, not the higher-math version.] Much of this subject is highly dependent on either calculators+ or tables [slide rules have been passé since the electronic calculator, but could be used.] Traditionally, this subject relies on some familiarity with "College Algebra", but not an intensive mastery. Easily review trigonometry as you work at a computer! I will remove instances of these kludge notations, without advance warning, when it is convenient in my schedule to do so. What are these trigonometric [trig] functions, anyway? What does a negative angle (measure) mean? Why should I know the generic right triangle? What are the reference triangles? Why should I know the unit circle? How does "wrapping the real number line" around the unit circle work? What are the triangle area formulae? What are the angle sum, difference, and/or doubling formulae? What are the angle halving formulae? What are the trig(onometric) sum and difference formulae? What are the trig(onometric) product formulae? Calculus 2000, Mr. Marco. Go to the bottom of the page, then start scrolling back upwards. There's trigonometry down there. Measures, Shape, and Space: Also has some links about coordinate systems and Euclidean geometry. What are these trigonometric [trig] functions anyway? These functions have a single argument, and take angles. By the heuristic of "wrapping the real number line around the unit circle," we can think of these functions as taking real numbers as arguments. Note that in "stratosphere" math, the above approach is very painful; other techniques are used to define these functions. These techniques are the ones which calculators are programmed with -- but they're not appropriate for this section. 1 circle = 360 degrees = 2π radians = 400 gradients. We inherited degrees from Babylonia. There are 60 minutes in a degree, and 60 seconds in a minute. [When dealing with the Earth's rotation in astronomy, the Earth rotates "about" 1 angular degree in 4 solar-day minutes. The Earth rotates 1 degree in 4 sidereal-day minutes.] Also, a nautical mile is "about" 1 arc-minute on the Earth's surface. This would be exact if the Earth was a perfect sphere. A common notation for, say, 3 degrees 4 minutes 5 seconds is 3°4'5". Radians are the "natural" angle unit when dealing with "stratosphere" math. The defining formulae for sin and cos are much simpler then. Radians also behave better if you have to deal with calculus [deriviatives and integrals]. I don't know much about the history of gradients. A right angle is 1/4th of a circle; i.e. 90°, π/2 radians, or 100 gradients. I will use the common symbol for a right angle, in the rest of this crash review. An angle larger than 0, but smaller than a , is called an acute angle. An angle larger than a , but smaller than half a circle, is called an obtuse angle. is a standard symbol in the literature (although found more often in geometry texts than trigonometry texts). When it shows up in a diagram, it designates the labeled angle as a right angle. For the record: Triangles are constructed by picking three points, then joining each pair by a straight line segment. We assume we can neglect curvature of the surface. That is, we assume the geometry is Euclidean. [You will not get the same kind of triangles on a sphere as on a flat desk or piece of paper. The sphere is visibly curved, the desk and the flat piece of paper are not supposed to be curved.] I will occasionally use the fact the geometry is Euclidean. The sum of the three (interior) angles of a triangle is half a circle, i.e. 180° or π radians or 200 gradients. I will sometimes denote this by 2 in the rest of this crash review; this is not standard notation. An implicit exercise will be translating 2 to angular measure [degrees, radians, and/or gradients.]. If we pick a point on a straight line, the two parts of the straight line formed by taking out the point form an angle of half a circle, i.e. 180° i.e. π radians i.e. 200 gradients. In general, I will omit "interior" when talking about angles of a triangle. We say a triangle, that contains a right angle, is a right triangle. If a triangle has two sides of equal length and one side of different length, we call it an isosceles triangle. If a triangle has three equal sides, we say it is an equilateral triangle. For an isosceles triangle, the two angles opposite the sides with equal length (i.e., the two angles whose bounding sides have one of the two sides of equal length, and the side with different length) are equal. For an equilateral triangle, all three angles are equal, and equal 60° i.e. π/3 radians i.e. 200/3 gradients. the generic right triangle, and the unit circle. Here, A, H, and O are acronyms for Adjacent [to angle], Hypotenuse, and Opposite [from angle], respectively. First of all, all physical angles have some size. We cannot visualize an angle with negative physical size. They do not exist in anything sufficiently similar to the physical space we live in. Then, a negative sign means we are measuring the angle "unconventionally", i.e. clockwise. This will simplify the use of some of the trigonometric identities we are going to look at. In all cases, division by zero should be interpreted as "undefined". If H=1, then O and A are simply cos(X) and sin(X). These identities do work when both functions involved are defined for the angle X, regardless of size. Another fact, of some use, is the Pythagorean theorem: H²=A²+O². If we relabel A as a, O as b, and H as c, we get the familiar form of the Pythagorean theorem: c²=a²+b². This only works for right triangles. The generalization of the Pythagorean theorem to non-right triangles is called the law of cosines. The generic right triangle also motivates some terminology [which we inherited from twelfth century Arabian mathematics]. First of all, we say two angles are complementary if they add up to a right angle. That is, for an angle X, we say -X is complementary to X. For instance, the angle in the upper right-hand corner is complementary to, i.e. the complement of, the marked angle in the lower left-hand corner. A related piece of terminology is supplementary angles: two angles are said to be supplementary if they add up to half a circle, i.e. 180° i.e. π radians i.e. 200 gradients. That is, 2 - X is supplementary to the angle X. To get an intuition for this, draw a unit circle with the horizontal axis.. Draw an arbitrary radius from the center to somewhere on the unit circle. The two angles formed between the radius, and the horizontal axis, are supplementary. What happens if we swap A and O in these formulae? This is computing the trig function of the complement of X, i.e. -X. Go ahead, do it :) It's easy. We say that sin and cos [sine and cosine], tan and cot [tangent and cotangent], and sec and csc [secant and cosecant] are cofunctions, and that the trig function of the complement of an angle X is equal to the trig cofunction of the angle. This is explicitly in the function names: cosine is the cofunction of sine, cotangent is the cofunction of tangent, and cosecant is the cofunction of secant. These identities do work for arbitrary angles. If one side is undefined, both sides are undefined. The reference triangles are right triangles that are "easy to construct". 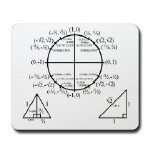 They provide easily-memorized values for the angles with measure 30°, 45°, and 60°, i.e. π/6, π/4, and π/3 radians, i.e. 100/3, 50, and 200/3 gradients. The 45-45-90 (degree) right triangle can be constructed from a square with sides of length one. The hypotenuse is the line connecting two opposite vertices of the square; it has length by the Pythagorean Theorem. [Exercise: compute this!] The legs of the triangle are sides of the square. Note: 45° is its own complementary angle. We now have a hypotenuse of length 2, one leg of length 1 [from bisecting the horizontal side], and one side with length [from the bisecting line]. The unit circle provides a picture on which to memorize reference values of the trig functions. Think of it as the set of possible endpoints for a length 1 hypotenuse H, with one endpoint of H fixed at the origin. We can construct generic right triangles with hypotenuse 1 in it. Pick a point on the circumference, draw a line segment from it to the origin, and then draw a perpendicular line segment down to the x-axis. Notice that the coordinates of the vertex, in Cartesian coordinates, is (cos(X), sin(X)), where X is the central angle. The horizontal side (on the x-axis) is A, and the vertical side (parallel to the y-axis) is O. The radius (length 1) is H. The slope of the hypotenuse H is tan(X). However, observe the four quadrants. Our example triangle has its hypotenuse in the upper-right quadrant [both coordinates positive]. Horizontal and vertical hypotenuses create line segments rather than triangles. Also, at least one of the coordinates go negative in the other three quadrants [upper-left, lower-left, lower-right]. If we interpret undefined as equal to undefined, these identities hold for arbitrary angles. Incidentally, the computation of the slope of the hypotenuse H via tan(X) also works for arbitrary angles. [Recall that an undefined slope corresponds to a vertical line]. Now, let's look at another way to reconstruct the cofunction identities i.e. the identities relating complementary angles. It is no coincidence that the slope of the line y=x is 1. This gives a central angle between the line y=x, and the x-axis, of 45° i.e. π/4 i.e. 50 gradients [think of the 45-45-90 triangle]; note that this is exactly half of a right angle. sin(-X)=-sin(X) "sin(X) is an odd function"
cos(-X)=cos(X) "cos(X) is an even function"
tan(-X)=-tan(X) "tan(X) is an odd function"
cot(-X)=-cot(X) "cot(X) is an odd function"
sec(-X)=sec(X) "sec(X) is an even function"
csc(-X)=-csc(X) "csc(X) is an odd function"
These formulae classify the trigonometric functions into even functions and odd functions. As you may recall from College Algebra, even functions are those functions whose value is unchanged by negating the argument, and odd functions are those functions whose value is negated by negating the argument. It is no coincidence that the slope of the x-axis is 0. The central angle of the x-axis with the x-axis is clearly 0 [degrees, radians, gradients, it matters not which unit]. 0 is also exactly half of 0. It is no coincidence that the slope of the y-axis is undefined. The central angle of the y-axis with the x-axis is clearly . This is also exactly half of 2 . Note that the inscribed hexagon can be considered as the 'splicing together' of six equilateral triangles. Now, observe that the horizontal side "above the x-axis" is bisected by the y-axis. Thus, the length of this side in the first quadrant of the unit circle is ½ [the triangle is equilateral, so the side being bisected has the length of the radius, i.e. is length 1]. That is, cos(60°)=½. Since 30° is the complementary angle to 60°, we also have computed sin(30°) and cos(30°). How does "wrapping the real number line around the unit circle" work? To formally demonstrate the n part, I would use natural induction, which should be buried somewhere in College Algebra. If you don't recall this term clearly, don't worry about it. However, I'm only going to explain it for n=1. i.e. tan(X+[½][circle])=tan(X). The identity cot(X+[½][circle]) = cot(X) is similar, but works with the multiplicative reciprocals throughout. There are two basic formulae, and one "impractical" one. To use this formula, pick one side of the triangle as the "base". Note its length. Then, draw a perpendicular line segment from the vertex of the triangle not in the "base", to the "base", and note this line segment's length (this is the height). [This formula does work for obtuse triangles. Extend the base to where it would hit the perpendicular line.]. EXERCISE: learn to use this formula by applying it to the reference triangles. The 45-45-90 triangle with hypotenuse should have area ½, and the 30-60-90 triangle with hypotenuse length 2 should have area /2. The n-dimensional formula is clearly dimensionally consistent: using a length unit, both sides have dimension (length)n. The n-dimensional formula can be directly computed if one is familiar with iterated integrals (say, from Calculus III or a decent physics course). "½ of the product of the lengths of two sides, and the sine of the included angle"
We can see this, from the immediately prior formula, by taking side 1 to be the base, side 2 to be the hypotenuse of the right triangle formed between the [extended, if necessary] base and the height, and then solving for the height in terms of side 2 and the angle between sides 1 and 2 [an acute angle of the right triangle we just constructed]. EXERCISE: Now, learn to use this formula by applying it to the equilateral triangle with all sides length 2. This triangle is essentially two copies of the 30-60-90 triangle referred to earlier, so its area is twice as large — . I do not know how to generalize the above formula to n-dimensional Euclidean geometry. This formula gives zero when the length of one side is the same as the length of the other two sides, but will malfunction when one side has length zero. The Heron referred to here is a Greek mathematician (B.C. ), so the formula can (or should be able to, at least) be derived in straight Euclidean geometry without coordinates. However, I have not read this, so I cannot explain it. EXERCISE: Learn to use this formula by applying it to the reference triangles, and also to the equilateral triangle with all sides length 2. The mathematician Cartan generalized this formula to n-dimensional Euclidean geometry, using matrix determinants [this is the determinant of a certain 3x3 matrix]. Cartan's generalization is definitely beyond the scope of this crash review. Note that the angles A, B, and C are strictly between 0 and 2 in angular measure. This means that solving for the sine of an angle by the law of sines does not strictly determine the angle, normally. [It does if the angle is a right angle; then sin(angle)=1]. If the solved-for sin(angle) is strictly between 0 and 1, then some work is required to determine the actual angles. The inverse sine function on a calculator, or spreadsheet, is programmed to give an acute angle [strictly between 0 and in angular measure]. However, since the sine of an angle X is equal to the sine of its supplementary angle 2 -X [sin(X)=sin(2 -X)], the supplementary angle is also a viable choice. This is the generalization of the Pythagorean theorem to non-right triangles. I'm going to present it "deus ex machina". cos( )=0. We get c²=a²+b², i.e. the Pythagorean theorem. Note: several entries in Trigonometry Survival 201 are/will be based on this. What are the angle-halving formulae? The angle-halving formulae are easily derived from the Pythagorean Identity and the formula for cos(2A). In general, we need to know which quadrant the angle A/2 is in to decide on the correct sign. If we know which quadrant the angle A/2 is in, we can decide on the correct sign in the above formulae. All are trig(onometric) sum or difference formulae. The first four are also product formulae. Set X=A+B and Y=A-B . Substitute in the angle sum and difference formulae for the affected functions, and simplify. Solve for A and B in terms of X and Y, and then replace A, B with their expressions in X, Y. EXERCISE: Numerically use the sum and difference identities for X=A+B, Y=A-B where A, B are reference angles. The tangent ones will break down when 90° is A, B, X, or Y. EXERCISE: Numerically use the product identities for A=(X+Y)/2, B=(X-Y)/2 where X, Y are reference angles. Wait! I'm not completely sure how to solve for A and B in terms of X and Y! We hope that by cleverly adding multiples of pairs of equations, we can get equations with reasonably isolated variables. This works fairly well with two variables. To solve for A, eliminate B from the resulting sum and then solve. Since 1+(-1)=0, we simply add both equations: X+Y=2A. Dividing by 2 yields (X+Y)/2=A. To solve for B, eliminate A from the resulting sum and then solve. Since 1+(-1)*1=0, we subtract Y=A-B from X=A+B: X-Y=2B. Dividing by 2 yields (X-Y)/2=B. Pick a linear equation using the "leading variable". If this variable's coefficient is not 1, divide the equation by this coefficient. This equation is now the "topmost equation". By adding a suitable multiple of the "topmost equation" to the other equations, remove A from the resulting equations. We are now done with the "topmost equation". Set it aside. When the only equations left have a multiple of a single variable equal to a constant, solve those variables. Then replace those variables in the equations that have been set aside. Repeat until all variables have been explicitly solved. X=A+B, Y=A-B: A is "leading variable". Both X=A+B and Y=A-B have coefficient 1 for A. However, the multiple of the "topmost equation" I am subtracting is 1[=1/1; numerator is from the equation I am subtracting from, denominator is from the "topmost equation". I arbitrarily choose my topmost equation to be Y=A-B. We subtract Y=A-B (i.e. 1*[Y=A-B]) from X=A+B to get X-Y=2B. We solve for B: B=(X-Y)/2. Isolating A, we end up at (X+Y)/2=A. Cramer's Rule: This is theoretically interesting, since it directly informs you when the system of linear equations does not have a unique solution. However, it requires the introduction of even more terminology. I won't cover it in this refresher. supplementary: the sum of the two angles is 2 i.e half a circle. Exercise: convert the angles to radians. If you plan to use gradients, also convert the angles to gradients. If you find this alternative table convenient, you may want to check that the entries that look different, do algebraically reduce to those in the first table. Suggestions: Note that 15° is computable either with the half-angle or the difference-angle formula from the standard reference table. Use both of these methods. Also, 75° can be computed by the sum formula from the standard reference table; use this method. Once you are confident that these tables are correct, and if you want more practice with the angle sum, difference, halving, and doubling formulae, use these additional reference values in combination with the earlier ones [0°, 30°, 45°, 60°, and 90°, i.e. the standard table]. Suggestions: First, let X be an angle such that 5X works out to be 0, 1, 2, 3, or 4 full circles. These are the equations that describe an inscribed equilateral pentagon. They are solvable using nothing more than the quadratic formula(! ), and what we already are supposed to know. sin(0°)=0, so we can factor sin(X) out of our expanded version of sin(5X)=0. Then, use the Pythagorean identity to replace cos²(X) with 1-sin²(X). Expand the results. This should give a quartic in sin(X) [oops], which is also a quadratic in sin²(X) [great]. Use the quadratic formula to solve for sin²(X). Then take square roots on the solutions we get for sin²(X); we need both the positive and negative roots. One of these root sets is for 72° and -72°, and the other one is for 144° and -144°. Geometrically, the larger positive root goes with 72°, and the smaller positive root goes with 144°. Solve for cosine of 72° and 144° with the Pythagorean identity [be sure to use the quadrants to force the correct sign]. Then fill in the table as summarized initially. Also: when completing the table, tan(18°) and tan(54°) [and their corresponding cofunction values, cot(72°) and cot(36°)] are technically difficult to algebraically compute directly from the sine and cosine values. [The denominator needs two stages to cancel out correctly.] I tried that three times in a row, and got three different answers, all of them wrong. The method I used for the table was to compute cot(18°) and cot(54°) respectively, and then take the multiplicative inverse algebraically to get tan(18°) and tan(54°). This isn't really "fair", since it relies on the "stratosphere" math approach. The first mention of the basis for this, traditionally, is in the middle of a Calculus series [business or conventional]. However, it is very practical. (Especially if you plan to use trigonometry in an engineering course.) I'm going to present how the result is arrived at in just enough detail, that those readers who actually know the relevant material will be able to see that I'm doing it right. What if you want the "instant trig table" to more decimal places? Just work the above bound calculations with 5*10-(number of decimal places+1) instead of 5*10-4. Note that at the final stage, I took the decimal my TI-36SX Solar calculator gave out, and found the three-decimal place numbers that bracketed it. For a different number of decimal places, bracket the result with decimals to as many places as you need precision. AMAZON.COM® is the registered trademark of Amazon.com, Inc.
Return to the Math page, or the Iskandria wargame requirements page, or the main page.